Does the Joker actually pag-ibig Harley? Have you watched the hillywood ipakita Dark Knight? 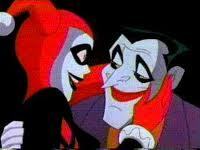 ang napili ng mga taga-hanga: Yeah Harley and the Joker are so cool in it! "What did you expect in this place? Its full of prutas loops and whack jobs. Its hardly gonna be a fun place to work" Sarah stated matter-of-factly. In the episode Harlequinade, who was hitting on Harley Quinn? ang mga taong mapagbiro at harly quinn Pagtitip.